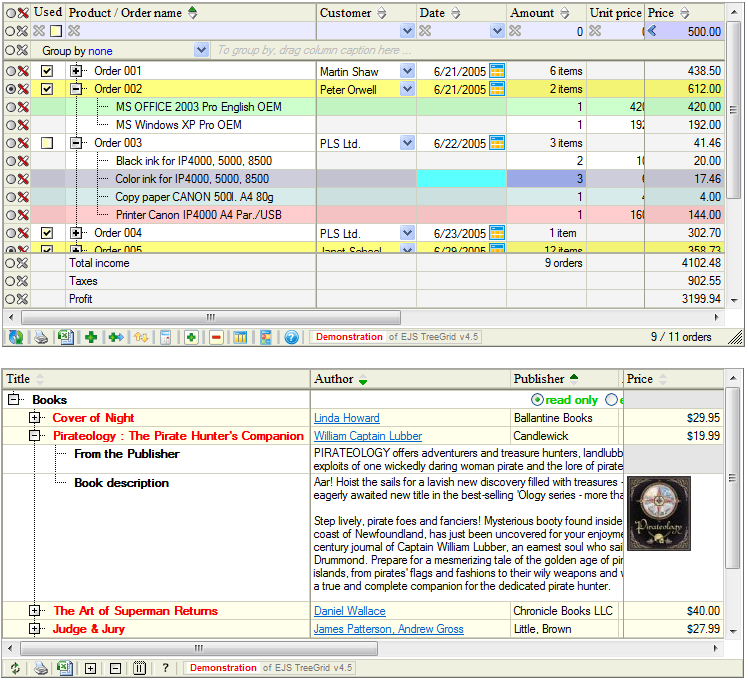 EJS TreeGrid of course supports all basic grid features like editing cell content, updating changes to server by AJAX or by page submit, sorting rows, adding and deleting rows, row state colors, column resizing, column hiding / displaying, control panel, various cell types like text, number, check box, textarea, combo box, image, url or any other HTML, calendar component to pick up dates and so on. EJS TreeGrid distribution contains many examples and predefined code for server side scripts ASP (VBScript), ASP.NET (C#, Visual Basic), JSP (Java) and PHP. EJS TreeGrid can be used also in any other server script environment that can handle and process XML data.